Steeped in history, Warwick provides the perfect backdrop to learning to drive. Warwick Castle was founded in 1068 by William the Conqueror and remains a top tourist attraction today. Your Warwick driving lessons, provided by one of our fully qualified, local driving instructors, will be taken around these quaint streets and surrounding areas covered by the Warwick test centre. 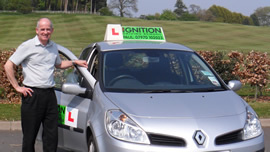 Ignition Driving School has been providing driving lessons in Warwick and the surrounding areas for over 9 years and has built up a great reputation and a lot of experience at the Warwick driving test centre. We can offer evening and weekend driving lessons and we also offer intensive driving courses, which can help you get up to driving test standard in a shorter space of time. Paul is the man who will help get you your licence, top instructor and a top bloke!Having been to other driving schools I can honestly say Ignition is on the money and has some of the best instructors in the Midlands.